India creates best honeymoon memories that last a lifetime with the honeyoomoners. 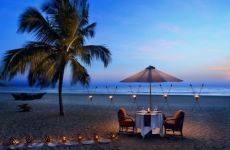 Honeymoon destinations in India offers best honeymoon places to experience spectacular scenery, remarkable adventures, attractive accommodations and welcoming people. Here's a list of the best honeymoon places in India to visit with your loved one. Newly married couples can plan their short trip to Tirupati for honeymoon. For cheap Tirupati honeymoon packages download ClearHolidays travel app today.